We always plant a garden in our backyard in the summertime. The tomato and pepper harvests seem to vary from year to year, but the one vegetable I can always count on to have an over abundance all season long is green beans. They’re easy to grow, easy to take care of, and they just keep giving and giving. Will enjoyed plenty of them in his baby food this summer, and we love to enjoy them simple steamed or sautéed with a bit of olive oil and garlic. Even with eating them two or three times a week with dinner, I STILL always have more than I know what to do with. Enter the dilly bean. I started canning them 2 or 3 years ago now, and they’re always a favorite around our house. While we’re fans of pretty much anything pickled in this house – dilly beans really stand apart from your “standards”. They are packed with wonderful dill flavor. So crispy and delicious. You can also pig out on the whole jar, and don’t have to feel that guilty about it. Try them as a garnish for your next Bloody Mary, instead of a boring stalk of celery! Pickled items are a great introduction to canning because you don’t need a ton of special equipment, and due to the high acidity of the brine – it’s virtually impossible for any bacteria to survive. Things like botulism, I hear they are not so good. At any rate, feel free to play around with the spice combinations. The only thing you want to adhere to for certain would be the water/vinegar/salt ratio. Prep your canning pot by inserting a rack to keep your jars off the bottom of the pot, place pint jars in and fill it with water. Bring to a boil to sterilize jars while you prepare the rest of your ingredients. 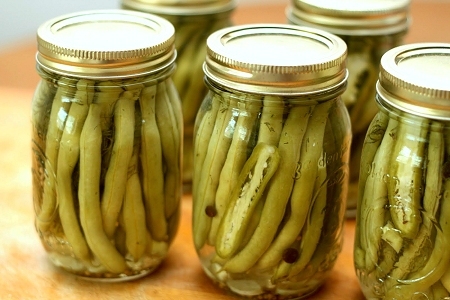 Wash and trim your beans so that they fit in your jar. Combine vinegar, water and salt in a medium saucepan and bring to a boil. While it’s heating up, pack your beans and into the jars, leaving 1/2 inch headspace (distance between the tops of the beans and the rim of the jar). To each jar, add 1 sprig of fresh dill, 1 chili pepper, 1/2 tsp dill seed, 1/2 tsp coriander, and 1 clove of garlic. Pour the boiling brine over the beans, making sure to leave that 1/2 inch headspace. Wipe the rims and apply the lids and rings. Process for 5 minutes in a boiling water bath. Let the beans hang out for a least two weeks before eating, to thoroughly develop their flavor. Best when served chilled. Hi Laura from the left coast(so cal to be exact). I’m not a huge fan of dill, but LOVE pickled green beans, especially wrapped with proscuito. can you sugest a substitute for the dill? My roommate in college would always bring pickled green beans back and I loved them! I love the heat in these:-) – will have to try them before the green beans disappear at the farm stand! Thank you for your recipe and instructions! Have you tried making things in a bath canner on a glass top stove? Sorry, Sharmel – I don’t have any experience with glass top stoves. I’d imagine it would be the same, though. How many pints does this end up making? About 6, give or take a pint. Are these spicy with the pepper ??? A little bit, feel free to leave the pepper out if you like!